The global economic slowdown in 2001 was dramatic in its suddenness and surprising in its severity. 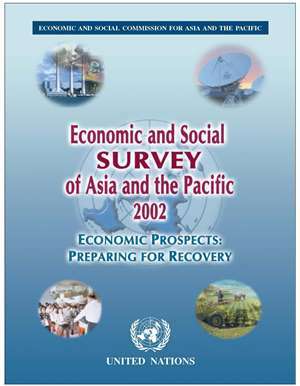 Output growth in the developing economics of the ESCAP region declines sharply, by almost 4 percentage points. Those economies with a high trade-to-GDP ratio or with a large exposure to ICT exports were hardest hit. Remaining relatively immune to the downturn, however, were several economies – including China, India, the Russian Federation and most other economies in North and Central Asia. Signs of a sustained upturn at the global and regional levels were mixed as at early March 2002. Evidence of a reasonable economic recovery is becoming more discernible, however. All in all, the developing economies of the region are expected to post a better trade and growth performance in 2002, although the improvement is likely to be modest for the great majority of them. The United Nations Millennium Declaration addresses the vast challenges facing humankind, and the millennium declaration goals are aimed at ridding humanity of extreme poverty in all its manifestations. On balance, there are grounds for optimism that most of these goals are achievable within the ESCAP developing region, notwithstanding the inevitable diversity in the speed and scope of such achievements among individual countries. Official development assistance to the ESCAP developing region has not returned to the levels of the early 1990s. Most such assistance is bilateral in nature. Notably, however, development cooperation among developing countries has become a significant phenomenon within the region. The important contribution of official aid to the realization of the millennium declaration goals, especially among the least developed countries, is well recognized.